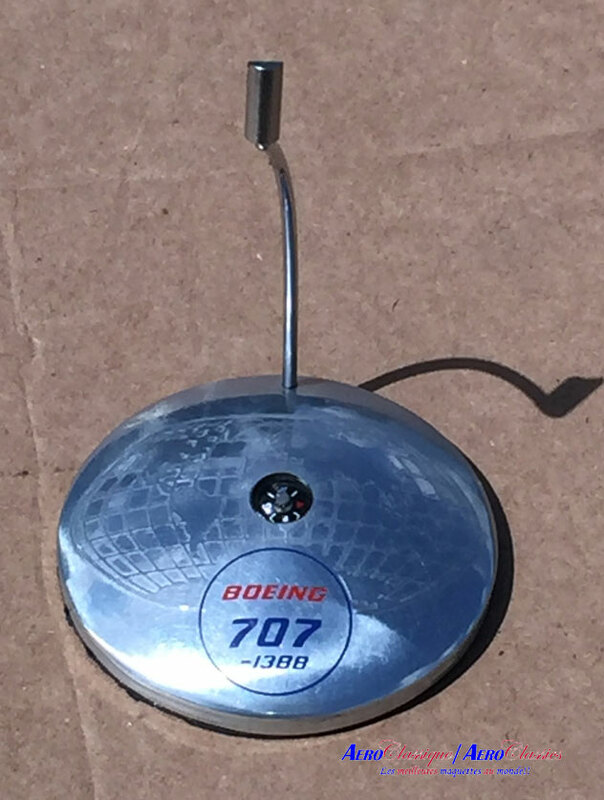 Aero Classics Accessory: one limited edition collectable, The Aero Classics Boeing B707-138 Polished Metal Aircraft Display Stand, is adaptable for use with all Aero Classics 1/400 or 1/200 Scale models. Using the enclosed adaptor, the stand can be used with most narrow body 1/200 Scale Aero Classics200 Models such as; Boeing B720’s and B707’s. Removing the adaptor will allow use of the stand with all 1/400 scale Aero Classics models. This stand comes with a small compass in the center, as well as printed with the B707 emblem. Some minor assembly is required. For Safety, the manufacturer recommends the application of glue when you assemble this stand. PLEASE TAKE NOTICE: This product is NOT REFUNDABLE. Aero Classics200 Models: one limited edition collectable, die-cast metal airliner model in a 1/200th scale of a Douglas DC-8-51 in the AeroMexico Early 1980’s Durango Colors Scheme. With titles Veracruz and a Polished Metal finish. Airframe Registration XA-PIK. This model is constructed of die-cast metal with some plastic parts. This product is available beginning in June 2018. Aero Classics200 Models: one limited edition collectable, die-cast metal airliner model in a 1/200th scale of a Douglas DC-8-51 in the AeroMexico Old 1970’s Colors Scheme. The Ship One series. Airframe Registration XA-DOE. This model is constructed of die-cast metal with some plastic parts. This product is available beginning in February 2018. Aero Classics200 Models: one limited edition collectable, die-cast metal airliner model in a 1/200th scale of a Douglas DC-8-43 in the Air Canada Airlines Old 1960s Colors Scheme. With a Polished Metal finish. This model includes a five (5) piece GSE Set. Airframe Registration CF-TJK. This model is constructed of die-cast metal with some plastic parts. This product is available beginning in December 2017. Aero Classics200 Models: one limited edition collectable, die-cast metal airliner model in a 1/200th scale of a Douglas DC-8-53 in the Air Canada Airlines Old 1970s Colors Scheme. With a Polished Metal finish. This model includes a five (5) piece GSE Set. Airframe Registration CF-TIH. This model is constructed of die-cast metal with some plastic parts. This product is available beginning in December 2017. 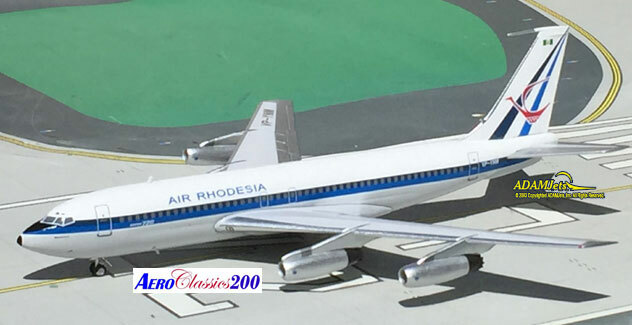 Aero Classics200 Models: one limited edition collectible, die cast airliner model, in a 1/200th scale of a Boeing B720-025 in the Air Rhodesia Airlines Last 1970’s Colors Scheme. With titles Wasbonaland. Airframe Registration VP-YNM. The model is constructed of metal with some plastic parts. This product was released in October, 2018. Aero Classics200 Models: one limited edition collectible, die cast airliner model, in a 1/200th scale of a Boeing B720-025 in the Air Zimbabwe Airlines Last 1980’s Colors Scheme. Airframe Registration VP-YNL. The model is constructed of metal with some plastic parts. This product was released in October, 2018. AeroClassics200 Models: one limited edition collectable, die-cast airliner model in a 1/200th scale of a Boeing B720-048 in the Braniff Intl. Airways Old 1970s Jellybean Ochre Colors Scheme. Airframe Registration N7081. This model is constructed of die-cast metal with some plastic parts. The product was released in December, 2015. AeroClassics200 Models: one limited edition collectable, die-cast airliner model in a 1/200th scale of a Boeing B720-048 in the Braniff Intl. Airways Old 1970s Jellybean Yellow Colors Scheme. Airframe Registration N7082. This model is constructed of die-cast metal with some plastic parts. The product was released in December, 2015. AeroClassics200 Models: one limited edition collectable, die-cast airliner model in a 1/200th scale of a Boeing B720-048 in the Braniff Intl. Airways Old 1970s Jellybean Dark Blue Colors Scheme. Airframe Registration N7083. This model is constructed of die-cast metal with some plastic parts. The product was released in December, 2015. Aero Classics200 Models: one limited edition collectable, die-cast metal airliner model in a 1/200th scale of a Boeing B707-138B in the BWIA - British West Indies Airlines Last Color Scheme. Airframe Registration 9Y-TDB. This model is constructed of die-cast metal with some plastic parts. This product is available beginning in April 2017. Aero Classics200 Models: one limited edition collectable, die-cast metal airliner model in a 1/200th scale of a Douglas DC-8-43 Combi in the Canadian Pacific Airlines Old 1960’s Colors Scheme. With script letters and titles Empress of Toronto with a Polished Metal finish. Airframe Registration CF-CPJ. Also includes a Set of five (5) GSE’s in matching scheme. This model is constructed of die-cast metal with some plastic parts. This product is available beginning in April 2018. Aero Classics200 Models: one limited edition collectable, die-cast metal airliner model in a 1/200th scale of a Douglas DC-8-51 in the Canadian Pacific Airlines Old 1970’s Colors Scheme. The Ship One series. With a Polished Metal finish, and a five (5) piece RETRO GSE set. Airframe Registration CF-CPN. This model is constructed of die-cast metal with some plastic parts. This product is available beginning in February 2018. Aero Classics 200 Models: one limited edition collectable, die-cast metal airliner model in a 1/200th scale of a Douglas DC-8-21 in the Compañia Aeronaves de México Original 1960s Delivery Colors Scheme. With titles Teotihuacan and a Polished Metal finish. Airframe Registration XA-XAX. This model is constructed of die-cast metal with some plastic parts. This product is available beginning in January 2018. Aero Classics 200 Models: one limited edition collectable, die-cast metal airliner model in a 1/200th scale of a Douglas DC-8-33 in the Delta Air Lines Old 1970's Widget Colors Scheme. With short Delta titles. Airframe Registration N8166A. This model is constructed of die-cast metal with some plastic parts. This product was released in Released in September, 2015. Aero Classics200 Models: one limited edition collectable, die-cast metal airliner model in a 1/200th scale of a Douglas DC-8-21 in the Eastern Airlines Old 1960s Golden Falcon Color Scheme. With a Polished Metal finish and titles Fly Eastern. Airframe Registration N8606. This model is constructed of die-cast metal with some plastic parts. This product is available beginning in July 2016. Aero Classics200 Models: one limited edition collectable, die-cast metal airliner model in a 1/200th scale of a Boeing B720-048 in the ELAL Israel Airlines Hybrid Color Scheme. Airframe Registration EI-ALA. This model is constructed of die-cast metal with some plastic parts. This product is available beginning in August, 2015. Aero Classics200 Models: one limited edition collectable, die-cast metal airliner model in a 1/200th scale of a Boeing B720-058B in the ELAL Israel Airlines Delivery Color Scheme. Airframe Registration 4X-ABA. This model is constructed of die-cast metal with some plastic parts. This product is available beginning in October, 2015. Aero Classics200 Models: one limited edition collectable, die-cast airliner model in a 1/200th scale of a Boeing B720-058B in the ELAL Airlines Old Color Scheme. With the 30th Anniversary Logo. Airframe Registration 4X-ABA. This model is constructed of die-cast metal with some plastic parts. The product was released in March, 2016. Aero Classics200 Models: one limited edition collectable, die-cast airliner model in a 1/200th scale of a Boeing B20-058B in the ELAL Airlines Revised Color Scheme. With a ELAL titles in Black and a Polished Metal finish. Airframe Registration 4X-ABA. This model is constructed of die-cast metal with some plastic parts. The product was released in February, 2016. Aero Classics200 Models: one limited edition collectable, die-cast airliner model in a 1/200th scale of a Boeing B720-058B in the ELAL Airlines Old Color Scheme. With the 25th Anniversary Logo. Airframe Registration 4X-ABA. This model is constructed of die-cast metal with some plastic parts. The product was released in March, 2016. Aero Classics200 Models: one limited edition collectable, die-cast metal airliner model in a 1/200th scale of a Boeing B720-058B in the ELAL Israel Airlines Last 1970's Color Scheme. Airframe Registration 4X-ABB. This model is constructed of die-cast metal with some plastic parts. This product is available beginning in October, 2015.